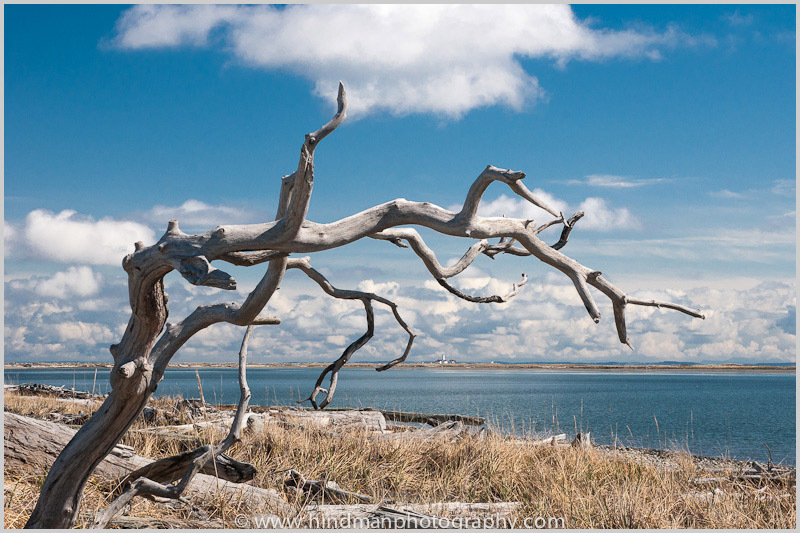 Here is a glimpse of a hike I did last week on Dungeness Spit, the longest natural sand spit in North America. It extends into the Strait of Juan de Fuca from the Olympic Peninsula and is growing in length by 14 inches a year. I have long wanted to hike it. The speck in the distance is the New Dungeness Lighthouse, the destination of our 11 mile out and back hike. This lighthouse has been in continuous operation since it was built in 1857 and is located in the Dungeness National Wildlife Refuge. I love the coast. I love walking the beach. I love cumulus clouds in a blue sky. I love sand, rocks and driftwood. I love wildlife refuges. 11 Apr	This entry was published on April 11, 2012 at 19:41. It’s filed under Coast, Nature, Pacific Northwest, Sky and clouds and tagged beach, clouds, cumulus, driftwood, Dungeness Spit, hiking, lighthouse, Olympic Peninsula, WA. Bookmark the permalink. Follow any comments here with the RSS feed for this post.